Lionel Cyr is a well-known volunteer in the community who has been living in the Valley for 70 years. Lionel Cyr is a well-known and popular volunteer in Port Alberni—a place he has lived for 70 years. “My family and I moved here in 1946 (I didn’t speak English at that time) and I attended school for four years here,” says Cyr. At 15, Lionel decided to go to work at a saw mill on Great Central Lake. His job there lasted until 1952 when the mill closed. From there, he went to the APD, and for 21 years worked as a maintenance supervisor both at APD and Somass Division. Following his retirement he “sat at home” for a while, but it did not last too long: “it was boring,” he says. So he began working on his own as a handyman, repairing appliances and other house items, a job he has kept until today. At 81, Cyr has not slowed down and continues with enthusiasm his commitment to helping others. It is this enthusiasm for which he is well known in Port Alberni; as an active volunteer he gives his time to individuals and organizations. Most recently, for example, he and his “Sunshine Club Servers” (as he calls them) assisted at the successful Jane Austen Festival. 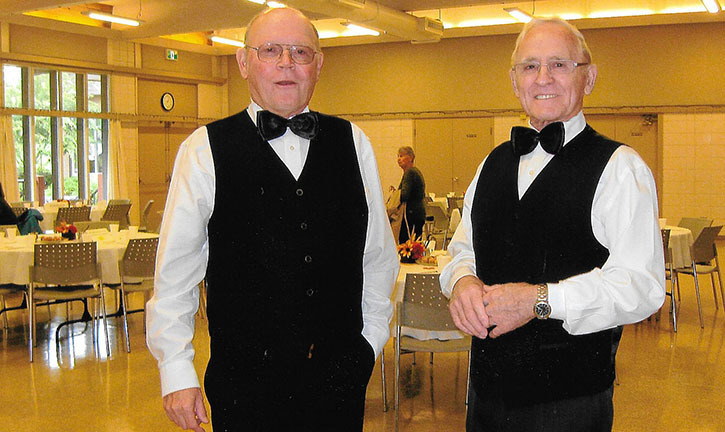 This is the same group of volunteers who make themselves available and help at the monthly “Special Events” program at Echo Centre and other seniors endeavours organized throughout the year by the Sunshine Club. “I have 21 members on my list and, I can tell you, we enjoy doing this,” he said. When asked about other involvement in the community, he does not hesitate in stating that he has been associated with the Alano Club for the past 54 years. “Currently, I am the longest serving member of the club”, he states with pride. And, since 1992, he has volunteered for the Royal Canadian Legion. Another interest of his is to drive and maintain his 1953 Ford car he uses at the Canada Day and Fall Fair parades for seniors to ride in these community events. He bought this green car 32 years ago and soon after he joined the “Golden Oldies” group. Music seems to be in his blood, as they say, because one of his passions is to listen to music, to sing along and best of all, to dance. A few years ago, he was a member of the “Folksong Circle” as well as the “Troubadours”, a male singing group, created and conducted by the late Sam McKimm; and for the past decade or so, he has been seen every Tuesday at the popular music jam and dancing session at the Hanson Hall. “If I started a new career in my life, I would be a dance teacher,” he says with a big smile on his face. As a devoted Catholic, Cyr has also helped at his church in different capacities throughout the years, including singing at coffee houses and other special programs. “You know, I helped with the construction of that church,” he says proudly. And adding to his long list of a busy schedule, he is seen regularly giving his time to Abbeyfield, Legion and Ty Watson House Hospice. Married to Kaye for 57 years, the Cyrs have a son who lives and teaches in Singapore. He has worked in many countries in Asia and Africa teaching in international schools. “We are happy to see him back visiting these days. His wife will join him here next week,” Cyr said. “Kindness, like a boomerang, always returns,”, is a saying by an anonymous source, and that fits Cyr’s approach to life.